The patented, original bag system that started it all… millions of bags sold since the first bag-grown tree was planted in 1980. 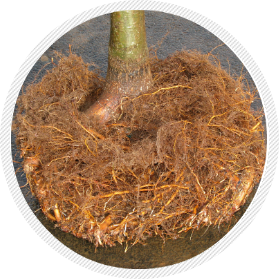 The Root Control Bag is a soft-sided fabric container that helps you do a better job of growing and transplanting trees. As the roots of the plant grow, they hit the fuzzy inside fabric of the bag. Roots do not circle on the fabric as they do against plastic. Instead the root is caught by the fuzzy inner surface of the material. The root penetrates the fabric. The tough fabric, however, prevents the root from expanding. The root is choked or girdled by the fabric. 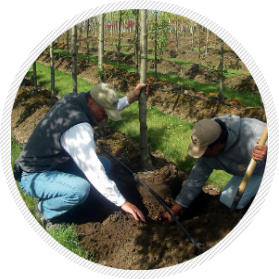 The choking causes the root to lose its apical dominance and lateral branching or pruning occurs inside the bag. 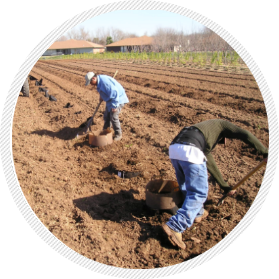 With the Root Control Bag, approximately 80% of the root structure is harvested with the plant. 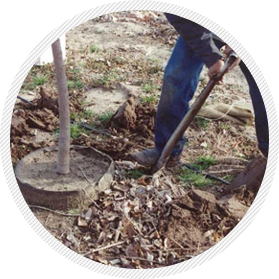 By contrast, a study at Michigan State University showed that up to 98% of a tree’s root structure can be cut away with normal digging procedures. That means more plants survive the harvest and more gains for your business. 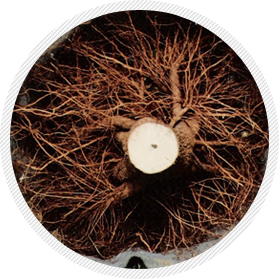 Keeping a bigger and better root structure also means a faster growing, healthier plant once it is re-planted. A transplanted tree, grown in a Root Control Bag would only take 1-3 months to recover and start growing again. Compare that to a tree grown in a ball-and-burlap (b&b) that could take 2-3 years to rejuvenate. With B&B, harvesting can only be done when the plant is dormant and when the ground is not frozen, severely limiting harvest times. With the Root Control Bag, the harvest window becomes much much wider. ProTip: don’t dig when the temperature is 100 degrees and don’t dig when the plant is coming into bud (for those who want to push the bag past logical limits). 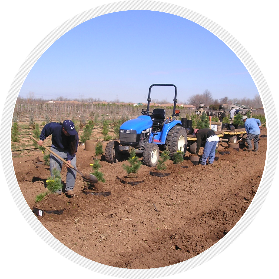 A typical 3-inch caliper tree in a standard ball-and-burlap weighs about 500 pounds and requires heavy equipment to move. 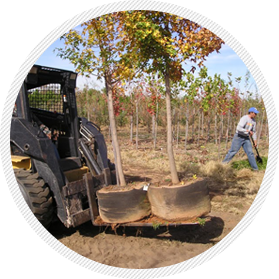 With the Root Control Bag, the same tree would be several hundred pounds lighter meaning you need less equipment and your trees are accessible to more customers. The smaller ball size also makes it easy to shift a bag grown plant into a larger wooden box or plastic container. The bag grown plant will root quickly into the larger pot, ready for a quick sale. The bottom of the Bag is applied by a hot melt glue process. The glue process leaves a flat bottom and no sewn seam through which a root can escape. The bottom of the bag is not creased or folded so roots do not grow into creases or folds making bag removal easy. As always, it begins by deciding what to grow and to what size caliper to grow it to. That will determine how you’ll space them out and what size bags to get. Give us a call or shoot us an email if you need help with any of this. We’ve been in this business for many decades and have helped customers through many different set ups. For an in-ground operation, it’s even more important that your planning is thorough. Once things are set in the ground it is much harder to make changes. The size tree you want to harvest dictates what size bag you should use. For example, if you want to harvest a 2" to 3" caliper plant, the 18" bag is best. 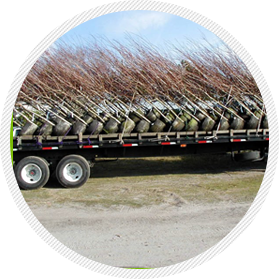 The AmericanHort booklet "American Standard For Nursery Stock" gives tree caliper size to bag size relationships. 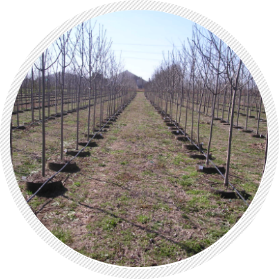 Call for current pricing and a complete discussion of the bag size to plant caliper size relationship. If your needs aren’t typical, we can custom make sizes. During Springtime, the busy season, early orders are greatly appreciated. In general, we always recommend placing orders 2 weeks in advance of when you plan to start using them. Planning is important. You’ll want to make sure you have your bags – as well as other structural equipment – ready BEFORE you receive your plants or they will sit out there and die. 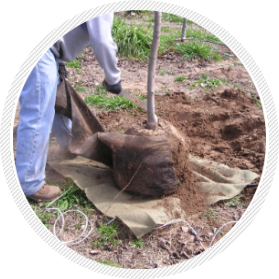 Trees or shrubs are planted into the Root Control Bag in the ground. The size plant you want to harvest dictates what size bag to use. You plant with an auger, using the same size auger as the size of the bag you’re planting with. Auger a hole and put the bag in the ground. To assure planting the Bag with a flat bottom and straight sides, use a sleeve when filling. High Caliper Growing sells a Fiberglass Sleeve made for planting. The fiberglass sleeve will expand slightly as you backfill, leaving a straight sided Bag. Fill in a few shovel fulls of soil, lift the sleeve up, complete filling the Bag and remove the sleeve. Take the sleeve to the next hole. Have enough sleeves to keep the planting crew moving. If you have 4 people on your planting crew, for example, 2 fiberglass sleeves should keep everyone busy. Most customers backfill the Root Control Bags with the same field soil they augur out. A few growers use a mix in the Bags in the ground. If you use a mix, be sure the hole will drain well. Do not place a light mix in a clay hole. Your augured hole will hold water and harm plant growth. Water and fertilize the same way you would with any in-ground system. 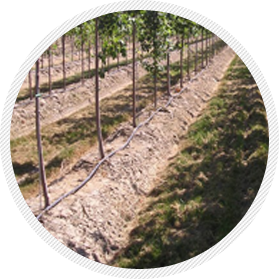 We recommend using a drip line, and then you can fertilize through the drip or granularly. 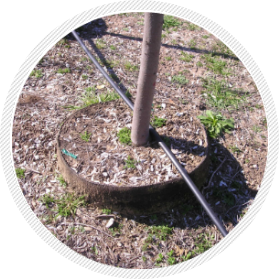 We recommend using a drip line for irrigation. Fertilize either through the drip line or broadcast granular fertilizer in the field. When broadcasting, place as much fertilizer in the bag as possible. Additional granular fertilizer placed directly in the bag may be advantageous. This is where you will *feel* the biggest benefit of an in-ground bag-grown tree. Harvesting is so much easier because everything is in a bag. It’s already been balled and ready to go, as opposed to the ball & burlap system where you have to dig up the tree either with a tree spade, or form the ball by digging by hand, then wrap the newly formed ball in burlap to keep it from falling apart. Of course, the ball & burlap digging process also cuts away the vast majority of the plant’s root structure. After digging, clean up the Root Control Bag. Shave away any excess roots that have penetrated the fabric. Knock off any dirt clinging to the outside of the bag. Keep plants in a holding area. Water as needed, preferably with a drip line directly on the ball. Most customers do not use mulch in the holding area as new roots may grow into the mulch. You may want to use mulch in the winter to protect the plant in the cold. Most customers do not use mulch in spring, summer or fall. Allow the outside of the bag to dry a bit before attempting to remove the fabric. Cleaning the ball and letting it dry a bit will make bag removal much easier. 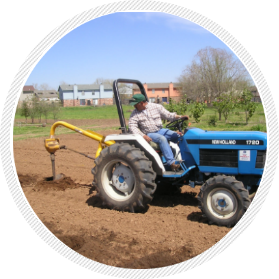 It is inevitable with an in ground operation that some plants will be harvested too early and others will be harvested late. Harvesting too early is similar to moving a small plant in a large container before the plant has had a chance to root out into the pot. The plant will survive, but it is easier to move the proper sized plant in the proper sized bag. Remember also that the bag works because the fabric root prunes the plant. If too large of a bag is used on too small a plant, little root pruning will occur. In harvesting late the bag will be more difficult to remove. Staking the plant after transplanting will be much more important, and watering the plant after installation more crucial. But you do have a much bigger harvesting window because an overgrown plant in the bag remains healthy. The roots do not circle or form in any way that would render the plant unsalable. Overgrown material is often transplanted into a plastic pot or wooden box and allowed to root out. The plant is then sold as a container tree. Many bag growers ship and handle plants right in the bag. To clean up the bag, shave off any root structure that has penetrated outside the fabric. Close off the top of the bag with a swatch of burlap. Tying the ball might help. Make sure to remove the fabric Root Control Bag before planting in the landscape. Cut the bag from top to bottom and peal the bag away. Where the bag hangs up on any root, cut the fabric around that area. Some growers remove the bag and wrap burlap around the ball before shipping. This eliminates the possibility that the landscaper will forget to remove the fabric at planting. 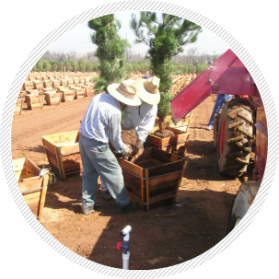 Many other customers remove the bag and place the tree in a large plastic pot or wooden box for sale. Wherever large pot or box material is sold, the bag to pot, or bag to box method of production is quicker, cheaper, and produces a better plant than traditional production methods.